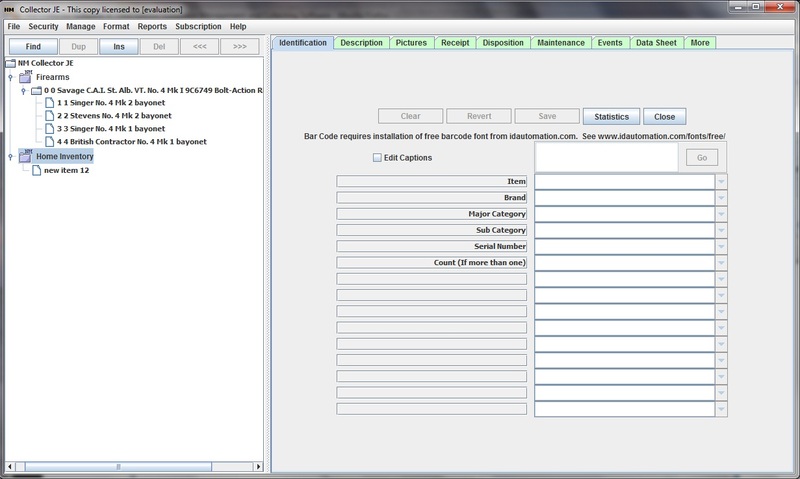 This step by step example with screen captures demonstrates how to create a new Collection Type using the NM Collector Software Home Inventory Template as an example. 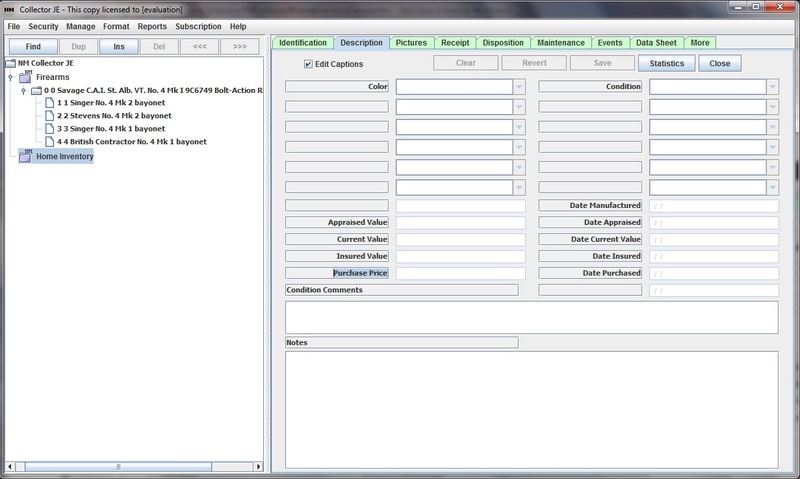 This Home Inventory Template is already available and comes ready to use with NM Collector Software. 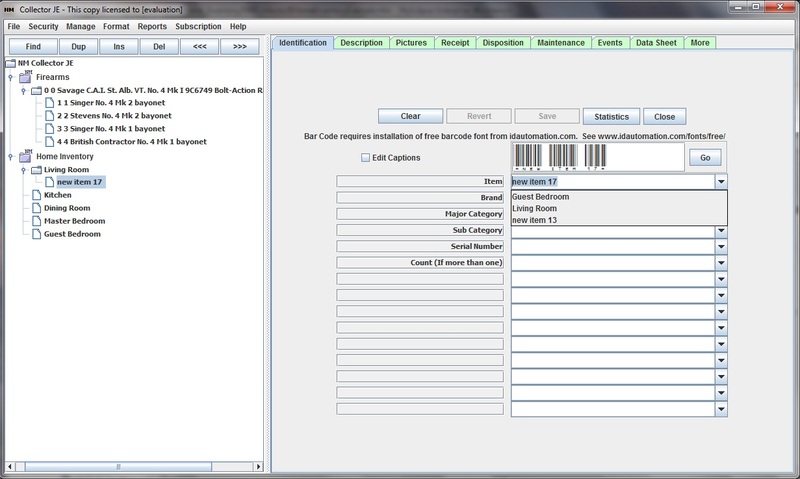 NM Collector Software is an effective tool for tracking your home inventory for insurance and other purposes. 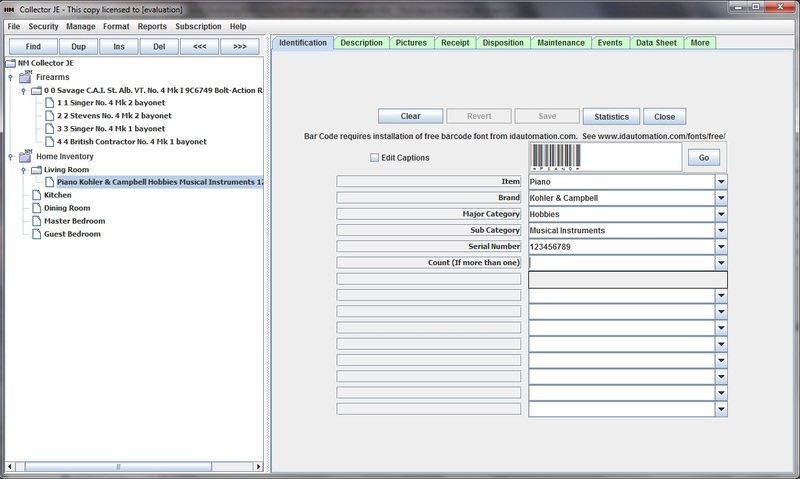 Track you items including detailed descriptions, pictures, and other details such as location and value. 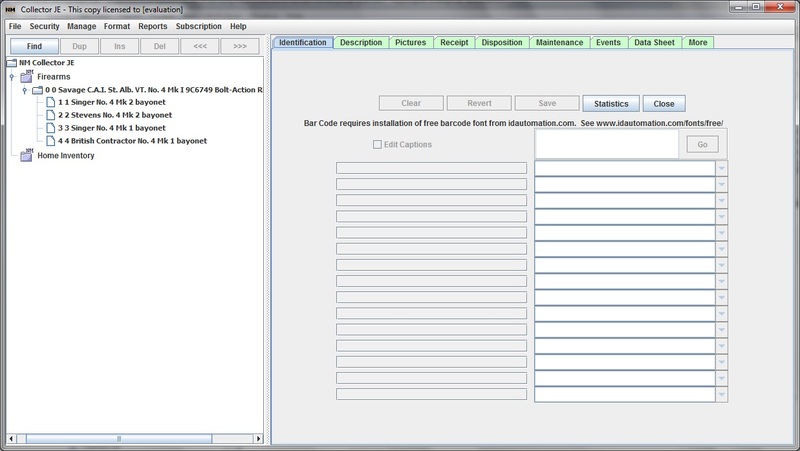 This example covers a lot of NM Collector software customization features for those interested in creating their own collection templates. By following the illustrated process, you will be able to create your own collection template for whatever you want to track. 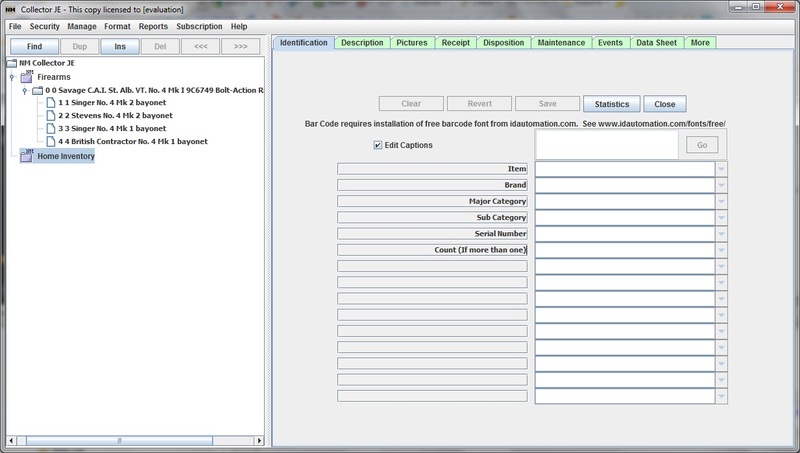 Please keep in mind these steps are not required for you to use NM Collector Software to track your home inventory. This template comes pre-configured and ready for you to use with NM Collector Software. The following steps demonstrate how to create a new collection type. 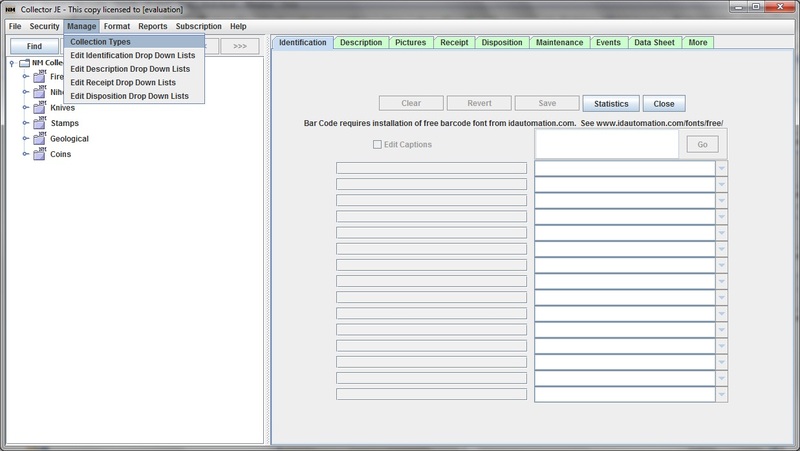 They also show you some of the features of NM Collector Home Inventory Software. Here you will find listed all of the currently defined collection types and whether or not they appear in the tree. A new row is added with default values. Type in new values for the Name and Description. Here we are indicating that we want to define a custom Home Inventory Software solution. While we are here, let us hide unused collection types by unchecking the Show In Tree column. Now your main window looks like this. Notice the tree view. We are on our way to a custom Home Inventory Software solution that meets our individual needs. in the tree view and check Edit Captions. Now start typing captions for the fields that you want to use.Keep in mind that this tab is for information used to identify items. The Description tab is for other information. So we will limit our entries on this tab to the very basic information required for identification only. This is a key feature of any home invntory software. Click the Description tab. Note that some captions are already provided for you. You can change the Date captions but the Values are used in the built in statistics so you can not change their captions. Here Edit Captions has been checked and all of the desired captions have been entered. Notice that I added Purchase Price and Date Purchased fields. These are available in the Receipt tab for those who purchase an activation. However, it can be easily added and recorded here for now. We are ready to start entering data. First switch to the Identification tab and make sure our Home Inventory collection type is selected in our tree view. Now we click the Ins button and a new item (with a generated default tree label) is added to our tree view under our Home Inventory collection type. Now we are ready to start typing in values for this new item starting with the Item field. At this point I realize that I probably want to record location some where. I could add a new location Caption in the description tab but I have decided to do something different. Instead, I will create location folders. I will then create items in those location folders. I start by selecting Home Inventory in the tree view and then clicking the Ins button. I then type Living Room into the Item field. I then repeat the process for each location folder until my tree view looks as follows. You can always create new location folders later as you need them. I want to add an item that is located in my living room. I select the Living Room item in the tree view and press the Ins button. This causes Living Room to become a folder and creates a new item within it. Here I have entered (but not yet saved) identification information for my first item. Note that you have to hit enter or tab out of the field to record the new value. This will add that value to the drop down list for future reference. You can manually edit values in drop down lists as well. Click the Save button to actually save the changes to the new item. 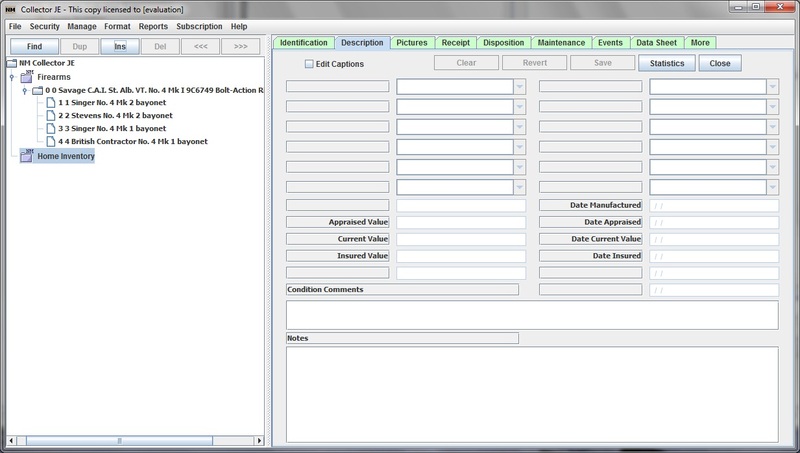 I will now click the Save button and switch to the Description tab with my new customized home inventory solution. Here I have entered (and saved) some description information. This is another key feature of home inventory software. Now I will enter more living room items. I select the Living Room folder and click Ins for each item of my Home Inventory that is located in the living room. Copyright © 2008, 2009, 2010, 2011, 2012, 2013 by nmCollector.net LLC. All rights reserved.